Not a month goes by without an article in the press criticizing the high fee structures of both hedge funds and traditional long only funds and their underperformance in comparison to their benchmark indices. 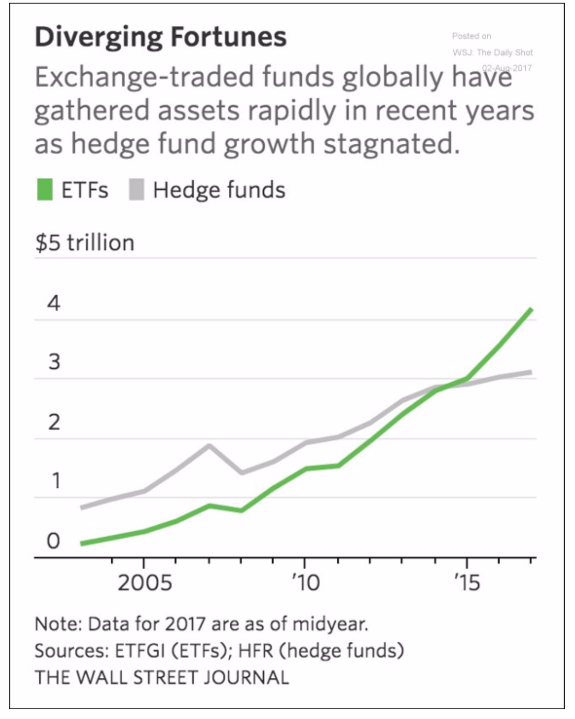 It comes as no surprise that ETFs have surpassed hedge funds in terms of total assets under management since the end of 2015 as they have become increasingly competitive in terms of pricing. The rise in passive investing has clearly made active management more challenging, particularly in a rising market, which we have had since March 2009 (the second greatest bull market in modern history). To illustrate this, there have been numerous studies produced by the likes of S&P Global highlighting the fact that over 70% of equity managers underperform their benchmark net of fees over 10 years. The record is far worse for investment grade bond fund managers. With an increasing number of competitors within the investment community chasing the same opportunities (particularly in the US) it has become increasingly challenging to generate Alpha. Violent sector rotations have also become increasingly prevalent in equity markets creating significant challenges for active managers. Where passives may run into trouble is during sideway markets and is when active managers should be able to outperform. During the past decade, it is estimated by JP Morgan that passives and quants have increased their share of equity trading volumes from less than 30% to around 60% dwarfing the volumes originating from fundamental discretionary managers. This partly explains the low levels of stock dispersion and high levels of correlations between stocks which makes it very challenging for active managers to outperform. In addition, it is becoming more difficult for active managers to compete against passive managers in terms of operating expenses not to mention the cost of regulation and technology. The low cost model no matter what the industry, is based on generating volumes and passives are no exception with the market leaders cutting fees with the goal of increasing their value proposition. Although they may continue to gain market share from active managers as investors realize the fact that many of their active managers underperform in the long run one should wonder what would occur if global markets had a massive pullback following a bull market that has 101 months in the making (the tech bubble that ended in March 2000 lasted 113 months!). The inevitable question arises as to who will be on the other side of the trade as there is bound to be an overshoot to the downside when everyone sells on panic mode. Together with trend following CTAs and the more fashionable cocktail of risk premia strategies out there which will tend to sell equities in a market downfall the wakeup call could be deadly. ETFs have clearly become more complex over the years and given the low levels in the VIX, leverage has increased in the aforementioned range of products. They have also become very creative; there is an ETF that is based on the inverse performance of the VIX which was up over 100% YTD (to the first week of August) and in the top 30 of the most traded securities. Creativity has no limits but could also be an accident waiting to happen! Next Chart of the Month - Japanese Yen: to hedge or not to hedge?